Afghanistan has been described as 'the worst nation in the world to be a woman.' More than fifty percent of girls who are forced into marriage are sixteen or younger. Too many women live in fear, and in many areas education and employment for women are still condemned. The women featured in We Are Afghan Women are fighting to change all that. From rug weavers to domestic violence counselors to business owners, educators, and activists, these courageous women are charting a new path for themselves, their families, their communities, and their nation. Meet Dr. Sakena Yacoobi, who ran underground schools for girls until the Taliban fell, and today has established educational centers across Afghanistan to teach women and girls basic literacy. Or Freshta Hazeq, who as a female business owner has faced death threats, sabotage, and even kidnapping threats against her children. Here too you will find the story of Naheed Farid, the youngest female member of Afghanistan's parliament. 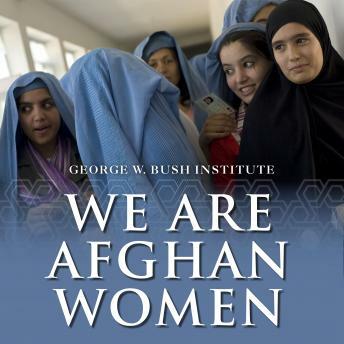 With an introduction by former first lady Laura Bush, We Are Afghan Women chronicles the lives of the determined women who are defying the odds to lead Afghanistan to a better future.